The historic vessel Maggie Lee, the focal point of a Save Maryland's Treasure's project sponsored by the Old Harford Town Maritime Center, is listed on the National Register of Historic Places. She represents a unique opportunity for the preservation of one of the state’s vanishing historical resources, an authentic Chesapeake Bay Skipjack. The Maryland oyster dredging boats are the last fleet in the United States to work under sail. Maggie Lee was built in 1903 in Pocomoke City, Maryland and was placed on the National Register of Historic Places in 1985 as part of a Thematic Group Nomination for the Chesapeake Bay Skipjack Fleet. She is one of the larger surviving skipjacks with a length of 51 feet on deck (72 feet overall) and a beam of sixteen-feet. In addition to being one of the oldest surviving skipjacks built in Maryland, the vessel is only one of two surviving Chesapeake Bay Skipjacks that were "framed" and planked fore and aft. The skipjack Kathryn (1901), a National Historic Landmark, is the other surviving skipjack of this construction. 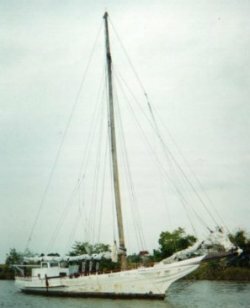 Based on a 1985 condition survey by Catherine C. McLaughlin, Marine Surveyor, it was reported that Maggie Lee, though initially constructed as an oyster dredge boat, has spent some time as a private yacht. During the Second World War she was drafted by the Coast Guard (under the Special War Powers in ref. To Documented Vessels Act) and she was pressed into government service for the duration. After the war, Maggie Lee was rebuilt by the federal government and returned to her owner where she continued to sail as a private yacht until her return to the dredging fleet. Maggie has dredged continuously (MD Dredge #9) until this past season when she was donated to the Old Harford Town Maritime Center (the Center), a nonprofit museum and education center. It is the Center's intention to restore the vessel to working condition to be used for interpretive and educational programs. The preservation and rehabilitation will take place in a replica 19th century shipyard that is to be constructed by the Fall of 2000.